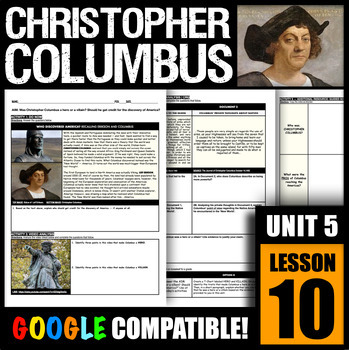 Was Christopher Columbus a hero or a villain? ACTIVITY 1 -- TEXT ANALYSIS: Students will compare and contrast the voyages of both Leif Erikson and Christopher Columbus. They will then determine whether or not anyone 'discovered' America. 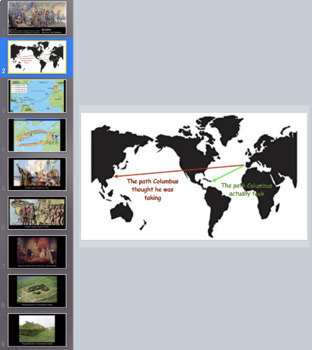 ACTIVITY 2 -- VIDEO: Students will analyze a video and identify three points that make Christopher Columbus a hero and three points that make him a villain. *LINK IS PROVIDED* -- in my district, YouTube is enabled. Check to make sure that YouTube is enabled in your district prior to purchase. If not, substitute for a video of your choice. Word Doc is provided for editing. 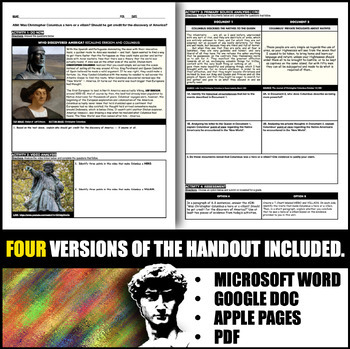 ACTIVITY 3 -- CRQ: Students will complete a CRQ in which they have to compare two documents about Columbus' voyages to the Americas. ACTIVITY 4 -- ASSESSMENT/POLITICAL CARTOON: Students will analyze a political cartoon. ASSESSMENT: Students may complete the cartoon for assessment, or answer the AIM using the R.A.C.E.S. format (FREE Download Here). 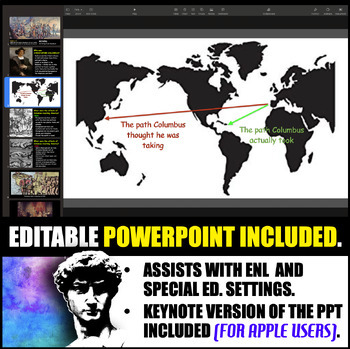 ADDITIONAL RESOURCE INCLUDED: PowerPoint with photos of Viking settlements and maps of Columbus' maiden voyage.